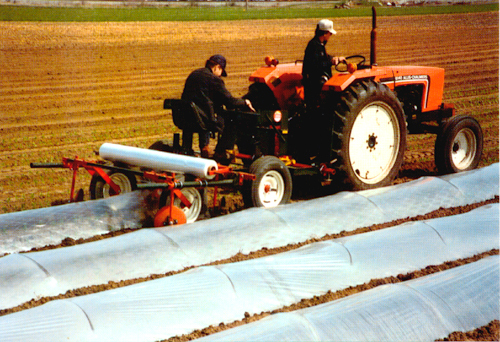 Mechanical Transplanter's Model 95 Wire Hoop Setter/Tunnel Layer combination sets the wire hoops for tunnels mechanically and lays clear plastic (not for row covers) over the hoops in a one-pass operation. It uses special reusable wire hoops, setting them 5' apart down the bed which support 6' wide clear tunnel plastic 12" off the ground. Price $6,700.00 Reusable Wire Hoops $0.46 each or $668.00 per acre (1,450 wires per acre).